Street Bridge. One of the passengers, Arland Dean Williams Jr, was aboard that flight, and helped rescue 5 other passengers before he drowned. He was a graduate of the Citadel in South Carolina. Washington Post said this about Arland Dean Williams. He was about 50 years old, one of half a dozen survivors clinging to twisted wreckage bobbing in the icy Potomac when the first helicopter arrived. To the copter’s two-man Park Police crew he seemed the most alert. Life vests were dropped, then a flotation ball. The man passed them to the others. On two occasions, the crew recalled last night, he handed away a life line from the hovering machine that could have dragged him to safety. 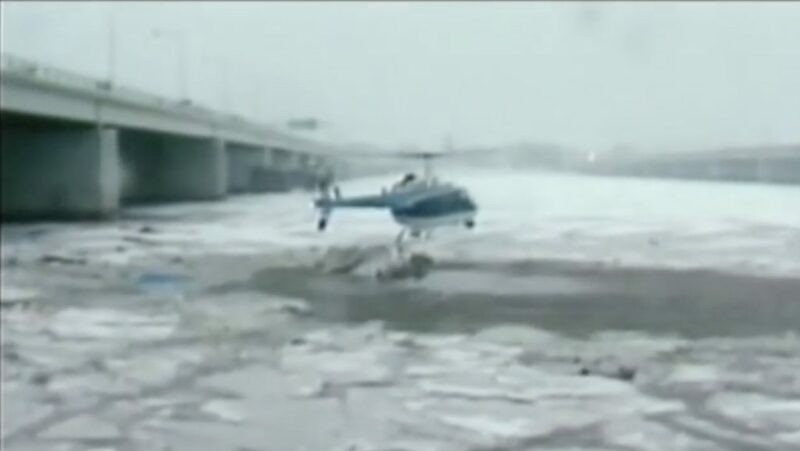 The helicopter crew – who rescued five people, the only persons who survived from the jetliner – lifted a woman to the riverbank, then dragged three more persons across the ice to safety. Then the life line saved a woman who was trying to swim away from the sinking wreckage, and the helicopter pilot, Donald W. Usher, returned to the scene, but the man was gone. The “Rochambeau Bridge,” was renamed the “Arland D. Williams Jr. Memorial Bridge” in his honor in March 1985.